JOHN MCENROE: IN THE REALM OF PERFECTION revisits the rich bounty of 16-mm-shot footage of the left-handed tennis star John McEnroe, at the time the world's top-ranked player, as he competes in the French Open at Paris's Roland Garros Stadium. Close-ups and slow motion sequences of McEnroe competing, as well as instances of his notorious temper tantrums, highlight a "man who played on the edge of his senses. 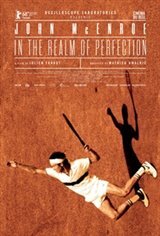 Far from a traditional documentary, Faraut probes the archival film to unpack both McEnroe's attention to the sport and the footage itself, creating a lively and immersive look at a driven athlete, a study on the sport of tennis and the human body and movement, and finally how these all intersect with cinema itself.